We have put together a programme that makes it possible for you to choose top qualitysocks for every working situation. In order to ensure comfort all day long, your work socks must be hard-wearing, have good padding and fit the foot better than ordinary socks. That is why MASCOT uses the best raw materials and technologies. Your feet exude moisture. 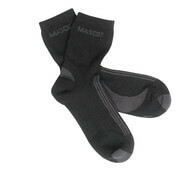 The socks’ job is to manage the moisture so your feet do not feel wet and thereby get cold. 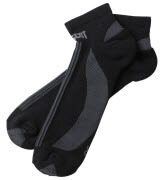 Work socks made from synthetic materials are good at transporting sweat away and drying quickly. If moisture can leave the shoe quickly, synthetic materials are a good choice. Socks with wool content are usually thicker and thereby warmer. Wool also has impressive moisture and temperature-regulating properties. Wool can absorb a lot of moisture, and as a result of the wool’s water-repellent surface, it will not feel wet against the skin. Wool even retains temperature-regulating properties, even when wet. Thick work socks will also usually relieve pressure on the sole of the feet. 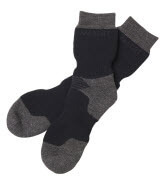 While footwear ensures support and stability, socks provide good comfort for skin and feet. The most important tasks for socks are to regulate heat, manage moisture and ensure that the feet are comfortable in the footwear. Comfort is paramount when you are wearing work socks for 10 - 12 hours a day. When you choose footwear, you usually ensure that there is a lot of room. When you choose socks, you should do the opposite. A good work sock should fit the foot tightly, and hug the foot snugly with elastic materials. It is almost better to choose a sock that is a little too small than one that is too big. That is because socks that fit loosely crease, and can give you blisters. Remember when choosing, thick work socks have a tendency to become a little looser that thin socks.